Billiards (in this case referring to English Billiards) is a game that is popular not just in England but around the world thanks to its popularity during the time of the British Empire. Billiards is a cue sport that is played by two players and utilises one object ball (red) and two cue balls (yellow and white). Each player uses a different color cue ball and attempts to score more points than their opponent and reach the previously agreed total required to win the match. 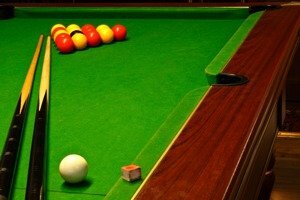 There are many forms of Billiards around the world, but it is English Billiards that is one of the most common and most popular. Originating in England, it is an amalgamation of a number of different games, including the ‘winning and losing carambole game’. The game is played across the world, especially in Commonwealth countries but over the last 30-years it has seen its popularity decline as snooker (a more straightforward and TV friendly game) has rocketed in the numbers both playing and watching on TV. The object of a game of Billiards is to score more points than your opponent, reaching the agreed amount that is needed to win the game. Like chess, it’s an immensely tactical game that requires players to think both attacking and defensively at the same time. Although not a physical game in any sense of the word, it is a game that requires a tremendous degree of mental dexterity and concentration. English Billiards can be played one-vs-one or two-vs-two with the singles version of the game being the most popular. The game is played on a table that has exactly the same dimensions (3569 mm x 1778 mm) as a snooker table, and in many places both games are played on the same table. Three balls must also be used, one red, one yellow and one white, and each must be 52.5mm in size. Players have a cue each which can be made from wood or fibreglass and this is used for striking the balls. The last essential piece of equipment is chalk. During the game, each player will chalk the end of their cue to ensure there is good contact between the cue and the ball. A cannon: This is where the cue ball is struck so that it hits the red and other cue ball (in any order) on the same shot. This scores two points. A pot: This is when the red ball is struck by the player's cue ball so that the red ends up entering a pocket. This scores three points. If the player’s cue ball strikes the other cue ball resulting it going down the pocket, then this scores two points. In-off: This occurs when a player strikes their cue ball, hitting another ball and then entering a pocket. This scores three points if the red was the first ball hit and two points if it was the other player’s cue ball hit first. Combinations of the above can be played in the same shot, with a maximum of ten points per shot possible. English Billiards is won when one player (or team) reaches the agreed amount of points needed to win the game (often 300). Despite their being only three balls on the table at any one time, it is a very tactical game which requires a tremendous degree of savvy gameplay as well as skill to ensure that you keep ahead of your opponent. As well as thinking in terms of attack and scoring points, it is essential for anyone who wants to win a game of billiards to think defensively at the same time and make things as difficult as they can for their opponent. All games of Billiards shall be played with three balls, consisting of a red, yellow and white. Each of the two players has their own cue ball, one having the white ball, the other the yellow ball. Both players must decide who is to break off first, and this is done by both players simultaneously hitting their cue ball the length of the table, hitting the cushion and returning back towards them. The player who gets their cue ball nearest to the baulk cushion at the end the shot was played gets to choose who breaks. The red is then placed on the Billiards sport and then the player going first places their cue ball in the D and then plays the ball. In-off: When your cue ball hits one of more balls and then goes down a pocket (2 / 3 points). Pot: This is when any ball other than your cue ball goes into a pocket (2 / 3 points). Cannon: This happens when the cue ball hits both other balls (2 points). Players remain on the table until they fail to make a scoring shot. Following a foul, the opposing player has the option of having the balls all put on their spots or leaving the table as it is. The winner of the game is the first player to the points total that was declared the winning total before the game.